So many readers wanted to know what was next for Katy and Richard. Melanie Moreland wrote this small continuation of their story for her newsletter, with the intention of eBook sites to offer free download. After hitting some Amazon roadblocks and head scratching as to how to let more people see it, an idea formed. She didn’t write this to make money, but to say thank you. So the best idea—pay it forward. 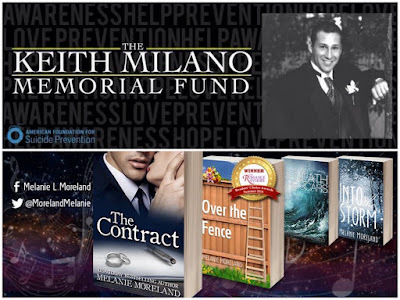 Melanie has partnered with the Keith Milano Memorial Fund, and all profits will go to this amazing charity which benefits Mental Health awareness, and suicide prevention. The add-on is releasing 7/3/16 and is available for pre-purchase. This story available for a limited time for 99 cents. If you have read The Contract, and want a little more —get your copy now and support a great cause! The Thanks is all mine Melanie!! I appreciate you supporting KMMF! Such a great idea you came up with to be able to share with readers and raise funds for mental health awareness. Win-Win! thanks for sharing this chapter with us! I suppose it will be a successful book! cheap paper writing service will help you to become a first-rate writer!